RYSE employs a core set of strategies that are grounded in racial justice, trauma-informed care, healing, and harm reduction and that elevate the lived expertise of young people. Among these strategies are Radical Inquiry and Base-and-Power Building, which facilitate systems transformation. 98% of RYSE members report feeling safer at RYSE than anywhere else. RYSE serves an average of 200 youth every month. 91% of RYSE members reported that RYSE helped them pay more attention to their emotions and feelings (de-stigmatizing mental health). 90% of RYSE members report that coming to RYSE helped them to better understand LGBTQQ issues. 93% of RYSE members feel better connected to their community. 94% of RYSE members have tried new things at RYSE. 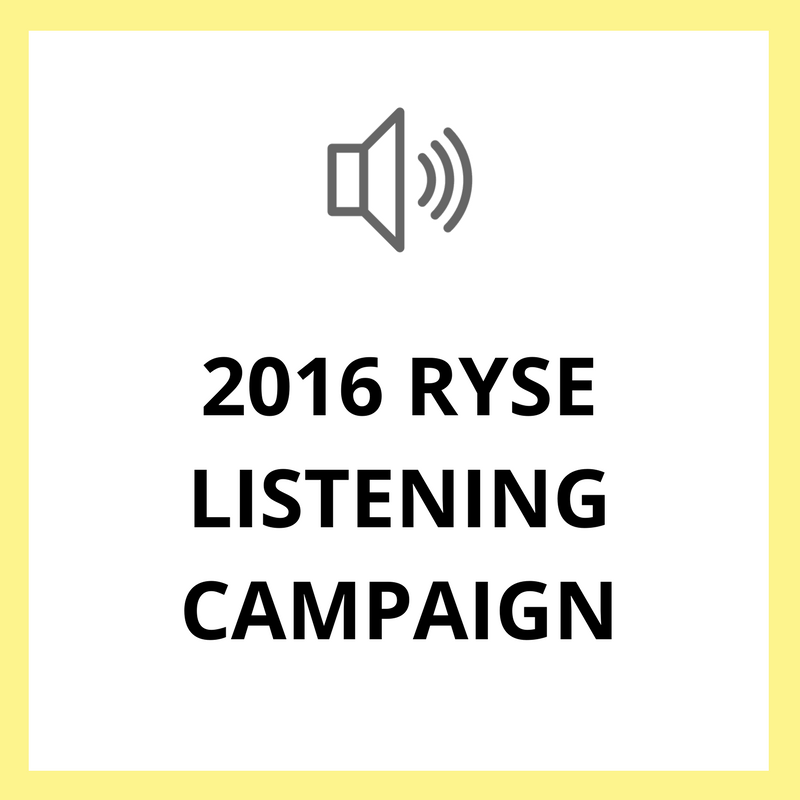 Three years ago, RYSE launched the Listening Campaign (LC), a community-engaged inquiry to better understand young people's experiences and articulations of trauma, violence, coping, and healing. This report is a detailed analysis of our findings. The Adverse Childhood Experiences (ACEs) study looked at how biopsychosocial experiences in childhood affected adult chronic disease, mental illness, and experiences with violence. RYSE expands on the original ACEs pyramid in this report. In 2015, the CA Children’s Defense Fund released Helping Children Heal: Promising Community Programs and Policy Recommendations, which highlighted RYSE as a success in encouraging trauma-informed policy change. This is a summary of Listening Campaign findings based on RYSE values that include recommendations for community members, schools, service providers, policy and decision makers, and young people. In 2017, RYSE Youth Participatory Action Research (YPAR) interns conducted a research project on gender-based violence and bullying among their peers. This is a report sharing their findings, recommendations, and experiences. RYSE works to shift the conditions of inequity and dehumanization of young people of color in our community. Our aim is to transform and create systems that effectively respond to and meet their priorities, needs, and interests. Towards this, we hold and cultivate a beloved community that meets young people where they are, supports them in where they want and need to go, stays brave and loving with them and on their behalf. For more than four years, our annual Trauma and Healing Learning Series continues to engage our communities in collective learning, shared commitment, and healing-centered practices to best serve our young people and families. Support our field building work. Give $75 to put healing at the center of movement building.